The fourth installment of the Life is Beautiful Music & Art Festival announces a newly designed IDEAS Series, featuring live discussions and interactive Q&A sessions with globally-recognized leaders who impact the world through transformation, innovation and passion. Headlining this year’s IDEAS Series is television personality, model, author and drag queen, RuPaul, who will appear on the Troubadour Stage on Saturday, Sept. 24 at 4 p.m. The 2016 IDEAS Series, curated by CatalystCreativ, highlights three different daily themes over the multi-day festival: “Self Transformation,” showcasing speakers telling their own journey of personal growth, inspiring listeners on how they can transform their own lives; “Local Transformation,” surrounding topics on how to make an impact in your local community, whether through exercising one’s right to vote or creating a new company; and “Global Transformation,” informing listeners on how to impact and transform societies and old ways of thinking through big ideas, movements and community service. Life is Beautiful’s IDEAS Series will offer festival attendees the opportunity to experience a variety of powerful voices in today’s generation including, but not limited to, CEO and founder of Lumoid, Aarthi Ramamurthy; Las Vegas-based spoken word poet, Audeo Piouz; actress on CW’s “Jane the Virgin” and entrepreneur, Azie Tesfai; sensational teen dancer on “America’s Got Talent,” Benjamin Yonattan; founders of Two Blind Brothers, Brad & Bryan Manning; New York Times best-selling Author, Cal Fussman; HBO Def Poetry Jam star and actor on “Inside Man,” Carlos Andrés Gómez; Lifetime’s “Little Women: LA” reality star, Christy McGinity Gibel; multimedia street artist, D*Face; founder of do-it-yourself lifestyle brand P.S. – I Made This, Erica Domesek; co-founder of I AM THAT GIRL, Emily Greener; founder and CEO of Spartan Race, Joe De Sena; founder and CEO of YING Bank, Karla Ballard Williams; digital interface innovator and founder of Novalia, Dr. Kate Stone; vice president of marketing and creative for Rock the Vote, Luis Calderin; entrepreneur and blogger, Maren Kate Donovan; actress and comedian, Maysoon Zayid; artist and author of I Can See Your Beauty, Nathanael Lark; American contemporary street artist, graphic designer and illustrator, Shepard Fairey; fashion expert and host of TLC’s “Love, Lust or Run,” Stacy London; American voice actor known for playing Phineas in Disney Channel’s “Phineas and Ferb,” Vincent Martella; top-selling author of “Flying without a Net,” Vital Germaine; and more to be announced. For the first time at Life is Beautiful Music & Art Festival, ticketholders will laugh until their sides hurt with the addition of THE KINDHOUSE, offering a daily standup comedy lineup. 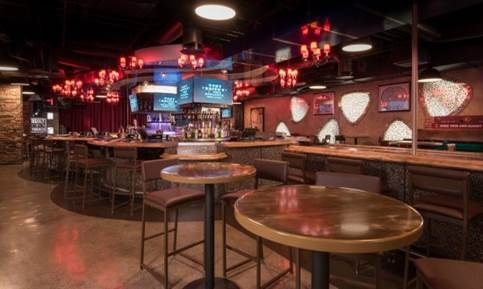 Located inside Place on 7th, the comedy showcase brings the venue to life with popular comedic acts, DJ performances, spa services, a lounge and bar, food trucks and more. Friday’s entertainment, sponsored by Zappos and hosted by Sam Tallent, will begin at 2:30 p.m. and run until 8 p.m., featuring performances by comedic masterminds Joe Gorman, Clare O’Kabe, Eddie Pepitone, Sean Keane, David Gborie, Todd Glass, Josh Androsky, Caitlin Gill, Kaseem Bently and Baron Vaughn. Presented by Crapshoot Comedy, Saturday will include three showcase style performances at 5:30, 7:30 and 9:30 p.m. lead by comedic stars, DJ Douggpound, Byron Bowers, Sean Patton and Emily Heller. Hosted by comedian Bobby Wayne Stauts, Sunday will feature local Las Vegas comedians, with two shows at 4 and 7 p.m. Comedians on the lineup include Ari Phillips, Matt Markman, Jozalyn Sharp and Jason Harris. Life is Beautiful will fill the streets of Downtown Las Vegas Sept. 23-25. In a return to their roots, Cirque du Soleil will thrill the streets of Downtown Las Vegas at Life is Beautiful Music & Art Festival, bringing performers from all seven resident shows in Las Vegas to the festival footprint on Friday, Sept. 23. Similar to Cirque du Soleil’s humble beginnings in 1984, where artists and fans were face-to-face, the landmark live entertainment creator and Las Vegas Strip staple will dazzle with acrobatics, dance and even more surprises throughout the evening. Life is Beautiful ticketholders will be treated to 30 minutes of live performances inside the festival grid every hour, occurring at 4:30 p.m., 5:30 p.m., 6:30 p.m., 7:30 p.m., 8:30 p.m. with a special finale at 9 p.m. 35 world-class performers from Michael Jackson ONE at Mandalay Bay Resort & Casino, Mystère at Treasure Island, “O” at Bellagio Resort & Casino, Zumanity at New York-New York Hotel & Casino, KÀ at MGM Grand Hotel & Casino, The Beatles™ LOVE™ at The Mirage Hotel & Casino and MINDFREAK® LIVE! at Luxor Hotel & Casino will astound fans as they dance, tumble and create memories for inspired crowds with performances rarely experienced at a festival. Chocolate has the power to transform a casual bite into a deep, multi-sensory experience. Journey 550 feet into the air on the High Roller, the world’s tallest observation wheel, as it launches the in-cabin chocolate tasting experience with Ethel M Chocolates on Thursday, Sept. 1. This is the first tasting experience of its kind in North America where guests will learn about the origins of chocolate and how the pieces were created, all while focusing their attention on the aroma, taste and texture. The 30-minute (one rotation) adventure includes a chocolatier ambassador showcasing five different types of pieces and the story behind them. For the second consecutive year, Insomniac’s Troubadour Stage will bring incredible production, awe-inspiring special effects and world renowned artists to the three-day Life is Beautiful Music & Art Festival. The all encompassing music, art, culinary and learning experience is set to take over 18 city blocks in the heart of Downtown Las Vegas Sept. 23 – 25, 2016. Standing 120 feet wide and 240 feet long, the domed Troubadour Stage features more than 10 lasers, 200 lighting fixtures and 590 video tiles hanging from its towering ceiling. Fans will be taken on a multi-sensory musical journey as 25 diverse artists perform unforgettable sets. Musical highlights from last year include Porter Robinson (live), Carnage, Cashmere Cat, Giraffage, Jauz, Madeon, The Magician, What So Not and more. In addition to the spectacular Troubadour Stage, Insomniac’s iconic art cars will roam the festival grounds, treating fans to pop up performances throughout the streets each night. Life is Beautiful Music & Art Festival is an annual celebration where people from all walks of life (generations, orientation, race, religion, and nationality) come together and create an experience centered in music, art, taste and ideas. That gathering of people, by very nature, becomes a platform in which positivity prevails, culture and creativity thrive and transformation occurs. Life is Beautiful launched in October 2013 featuring marquee musicians, chefs, artists and speakers. Held in the heart of Downtown Las Vegas, Life is Beautiful attracted more than 100,000 attendees in 2015. Shania Twain fans should prep their voices and study their Shania lyrics, as one lucky winner will receive a trip to Las Vegas to see the multi-platinum artist‘s new show, SHANIA: STILL THE ONE, at The Colosseum at Caesars Palace. The winner will also be given the once-in-a-lifetime opportunity to perform on his or her own for up to a week in a Caesars Entertainment venue on the Las Vegas Strip. Fans will be able to audition by singing their favorite Shania song in a custom-designed singing space in Caesars Entertainment’s Total Rewards booth at the CMA Music Festival June 7-10. The booth will be located in Fan Alley off Broadway and 4th Avenue, and will be open 10 a.m. – 6 p.m. June 7, 8 and 9 and 10 a.m. – 4 p.m. June 10. Shania kicks-off her highly anticipated Las Vegas residency show SHANIA: STILL THE ONE at The Colosseum at Caesars Palace on Dec. 1, 2012. With STILL THE ONE, Shania joins fellow Canadian national-treasure Celine Dion, and international superstars Elton John and Rod Stewart as resident headliners at The Colosseum at Caesars Palace. Throughout June, Club Cortez players winning a jackpot of $200 or more on a slot machine, a $200 or more jackpot on a video poker five-cent or lower denomination machine, a $300 or more jackpot on a video poker ten-cent or high denomination machine or a $200 or more jackpot on live keno will receive a free El Cortez logo Island Shirt. All jackpot winners will also receive an entry into the weekly Saturday night 40” LCD HDTV giveaway and $2,000 cash prize drawing. Please see Club Cortez for additional information and to redeem tickets. El Cortez Hotel & Casino will serve free slices of fresh Marie Callendar’s apple pie in honor of Flag Day for all Club Cortez members on Thursday, June 14 from noon to 6 p.m. Club Cortez members can enjoy the treat game side while playing slots and table games. Any Club Cortez member earning 500 Club Points in a single day is eligible to play in the daily slot tournament the following day. Available 24 hours a day, players insert their Club Cortez card in any tournament machine, play the session and check their standing beginning at 10 a.m. the following day. New Club Cortez members staying at the El Cortez also get a complimentary entry into the slot tournament. Highest daily tournament point winner receives $250, the second highest receives $150 and the third highest $100. The daily top ten players receive an entry into the weekly Saturday night 40” LCD HDTV giveaway and $2,000 cash prize drawing. See Club Cortez for additional details. Club Cortez players have an opportunity every week to win a 42” LCD HDTV or one of four $500 cash prizes every Saturday. During the week, players winning a jackpot of $200 or more on a slot machine, a $200 or more jackpot on a video poker five-cent or lower denomination machine, a $300 or more jackpot on video poker ten-cent or higher denomination machine, or a $200 or more jackpot on live keno are awarded one entry for the Saturday night drawing at 8 p.m. Winners have two minutes to claim their prizes at the Club Cortez Booth from the time each winning ticket is drawn. Please see Club Cortez for additional information. Club Cortez players have an opportunity every week to win $500, $300, $200 or $100 in promotional chips. There will two $100 prizes offered in total for fourth and fifth place. During the week, entry tickets in the drawing can be earned during blackjack, roulette and baccarat. During blackjack, tickets are distributed to players when the dealer receives a blackjack, during roulette, tickets are distributed to players when a 0 or 00 is hit, and during baccarat, players receive a ticket every time a “tie” hand is dealt. Double tickets will be given to players every Saturday from 8 a.m. to 12 p.m. Players can only win one prize per drawing. There is no limit to the number of entries a player may submit. Winners are drawn every Saturday at 12 p.m. Winners have two minutes to redeem their prize. Promotional chips may be placed on any even money bet on blackjack, roulette or baccarat. Please see Club Cortez for additional details. Fans of the popular show are invited to watch the two-night season premiere event asaward-winning chef Gordon Ramsay spices up the 10th season of Hell’s Kitchen with 18 new competitors on Monday, June 4 and Tuesday, June 5 on FOX. The newly opened restaurant Gordon Ramsay Steak at Paris Las Vegas will be the site of thelife-changing grand prize: a head chef position working under Executive Chef Kevin Hee. Viewers can enjoy a properly cooked beef Wellington, the dish Gordon Ramsay calls the best measure of a cook’s ability, while watching the fiery chef instruct the culinary hopefuls in proper technique and cooking time. Play begins at the world’s largest, richest and longest-running poker tournament. The action kicks off Sunday, May 27 at noon for the annual Casino Employees Event – a unique event that brings all casino employees around the country together under one roof. 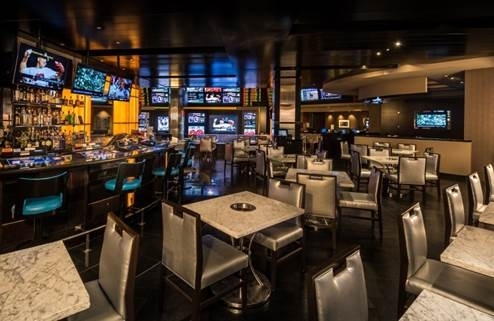 On Memorial Day Monday, huge crowds of poker players will descend on Rio All-Suite Hotel & Casino for a $1,500 buy-in No-Limit Hold’em tournament that serves as the first official open WSOP gold bracelet event. The World Series of Poker is the gaming industry’s premier event, each year drawing tens of thousands of poker enthusiasts from around the globe toLas Vegas to compete for millions in prize money and the game’s most coveted trophy – a World Series of Poker Champion’s Bracelet. On Monday, May 21, Steve Martorano hosted all 51 of the 2012 Miss USA contestants along with the reigning Miss USA for dinner at his famous Italian restaurant at Rio All-Suite Hotel & Casino. The girls enjoyed a special three-course menu including Martorano’s famous homemade meatball and South Philly salad. Halfway through the dinner, Martorano stole the show himself by manning the DJ station and started a spontaneous dance party that took over the entire restaurant. After a few songs Alyssa Campanella, Miss USA 2011, started a Conga line that weaved through the restaurant. The 2012 Miss USA contestants break out with a dance party in the middle of dinner to Martorano’s DJ skills. Boxer Victor Ortiz Launches Skin Care Line! If you ever thought, “I wish a Professional Boxer would launch a Skin care Line” well you’re in luck. 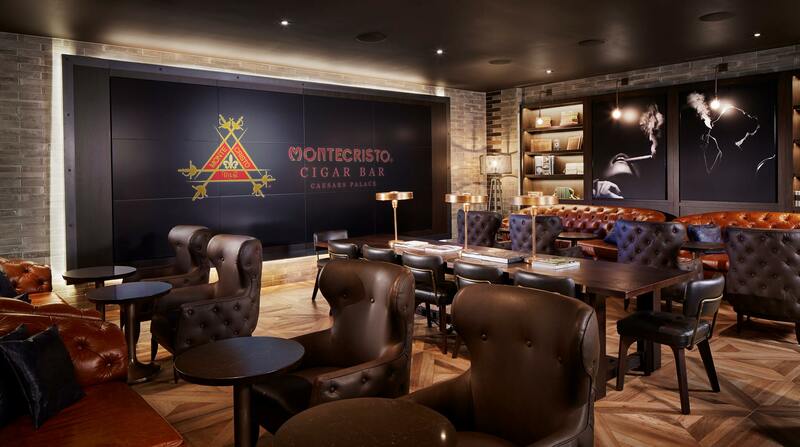 Victor Ortiz will launch a Skin Care Line at the Rio in Las Vegas on May 26. Following the music awards last night, R&B artist Ray J and model Sophie Monk hosted a launch party for Prince Reigns at The Voo inside VooDoo Beach at Rio All-Suite Hotel & Casino. The duo was recently named the celebrity faces of the ingrown hair removal product which is exclusively sold at Rio Spa & Salon. Ray J’s sister Brandy, DJ Paul from Three 6 Mafia and the Rio’s own premiere male revue, Chippendales, were there to support the event. The faces of Prince Reigns, R&B artist Ray J and model Sophie Monk, pose on the red carpet for the product launch party. Singer Brandy stopped by the event to support her brother Ray J. 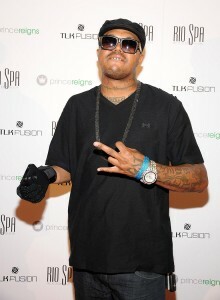 Three 6 Mafia member DJ Paul on the red carpet. John Rivera, Jace Crispin and Chaun Thomas of the Chippendales supported the cause before their show at Rio.